Shares in TalkTalk have fallen over 10% after the broadband provider cut its dividend and warned profits will fall. TalkTalk reported a £133m pre-tax profit for this year, up from £107m for 2016, but said it expected earnings to fall again this financial year as it invests to attract new customers. The firm suffered a major hacking attack in 2015 which saw its profits halve that year. 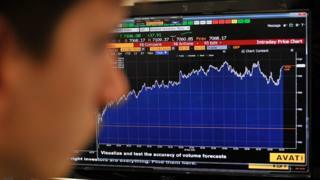 The FTSE 100 overall was flat, up 0.03% to 7,344.5. Barratt Developments was one of the few bright spots, surging 4.3% after the house builder said full year profit would be at the top end of forecasts. The firm expects a £733m pre-tax profit for the year to the end of June, up 7% on the previous year, despite building a similar level of homes. The builder has been boosted by rising house prices and government schemes to help people get on the housing ladder. ITV shares fell 1.4% after the broadcaster reported a 3% drop in revenues for the first quarter of this year. On the currency markets, the pound was up 0.23% against the dollar at $1.2966 and up 0.12% against the euro at 1.19070 euros. Brent crude prices were 0.7% higher at $49.07 per barrel.